Designed to stimulate arousal, ID Pleasure Sensual Lubricant, combines the natural sensation-enhancing ingredients ginko biloba and red clover with ID Glide's premium formula. Clear, odorless and water-based, ID Pleasure, is silky smooth, ultra long lasting and latex compatible. The problem is that it contains Parabens. These have been found to cause health problems and is why we will not carry their products until they change this. 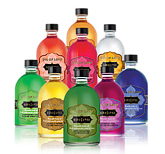 We do carry paraben free, glycerin free arousal gels and lubricants. Alters estrogen in women, increasing related diseases such as breast tumors. Heightens allergic reactions like contact dermatitis and rosacea. Decreases sperm cell count in males. Spurs the development of skin cancer. Causes problems to fetal development for pregnant women.